Arlington is the largest city in the United States without transit, but will run trains through the city for the Superbowl coming in 2011. Vancouver does Granny Flats in high rises. 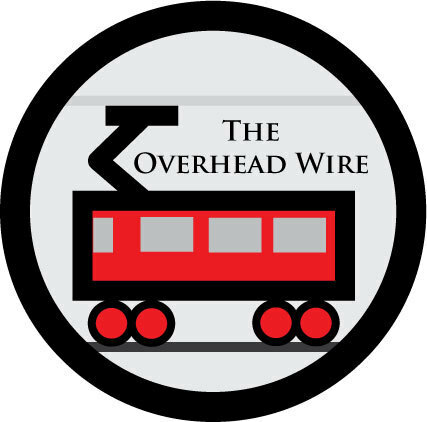 Seattle Mayoral candidate McGinn is floating ideas for another light rail election in two years. 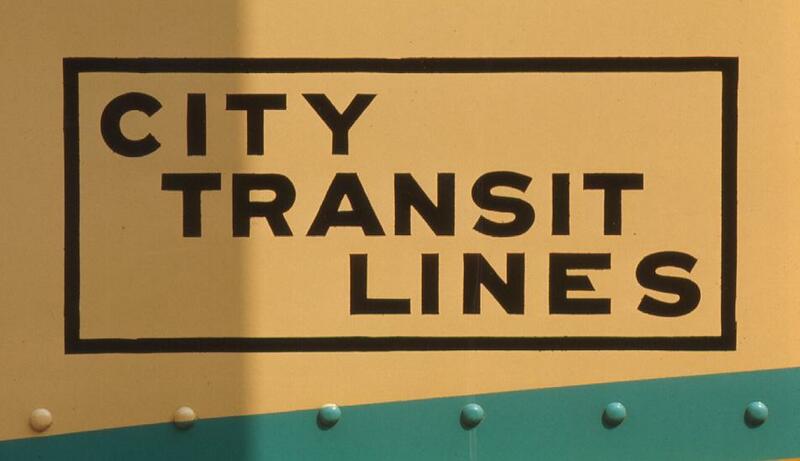 But by light rail does he mean rapid streetcar or light metro? A dustup over trolley buses in Seattle. I'd be interested to see if the bean counters actually did a lifecycle analysis considering how long electric trolleybuses actually last. Anyone who takes away existing hydro powered transit and replaces it with diesel needs a head check. It's unfortunate that it is even being discussed at all. The economy isn't being so kind to mixed use projects in Atlanta. That thing about Arlington TX is nuts! Why just have TRE service as a one day thing? 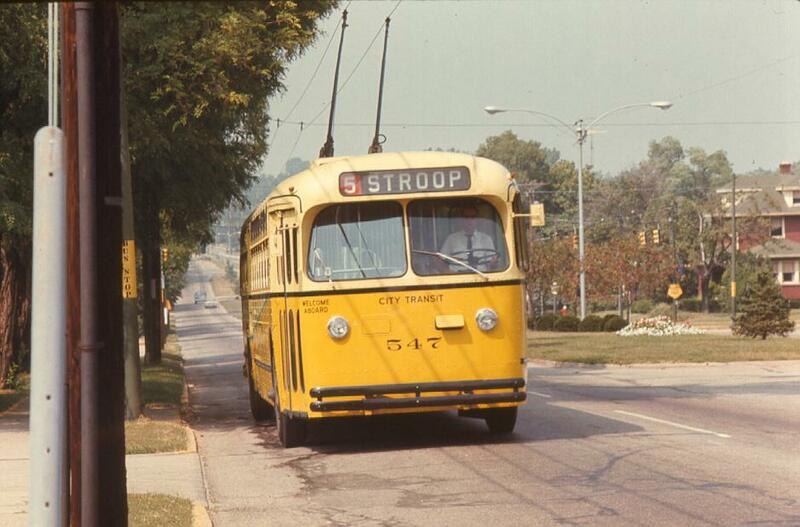 Edmonton's trolleybuses are now gone. 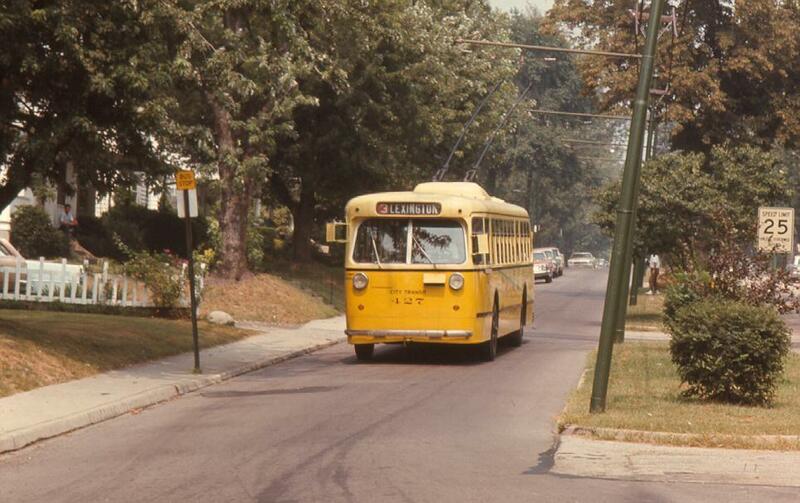 Philadelphia got funded for all their lines, but abandoned the southside routes. 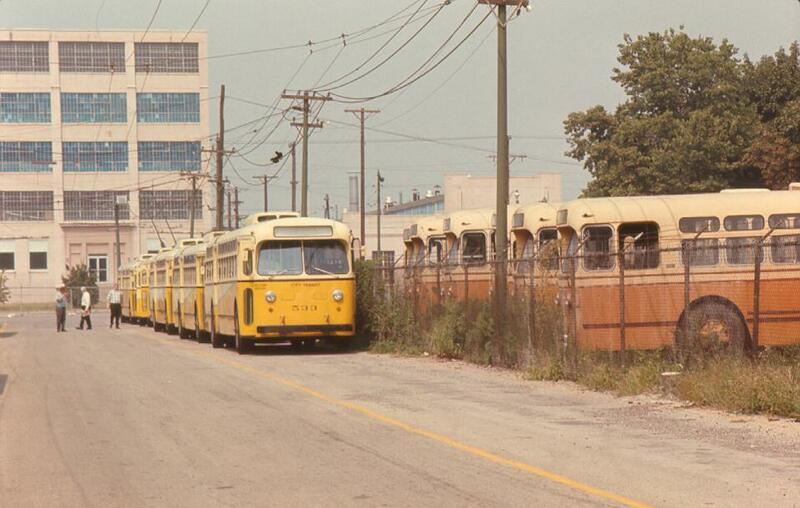 A friend who recently visited Dayton said their trolleybuses would probably be gone in a year. 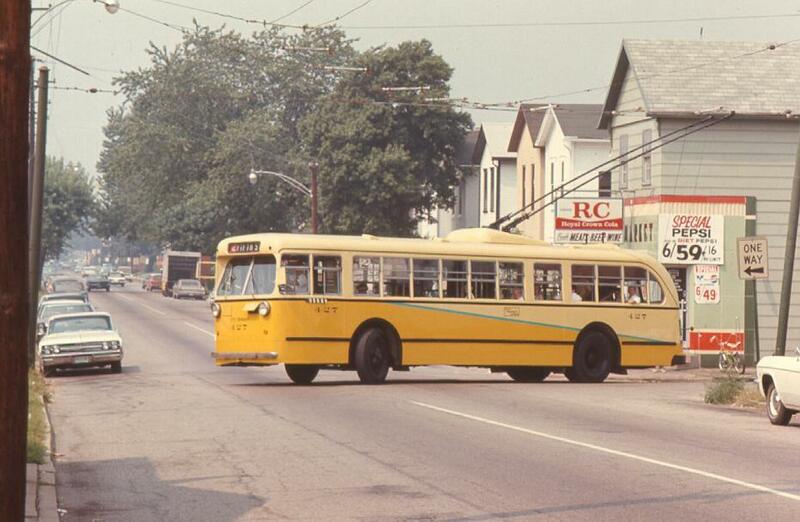 I remember visiting Dayton in the late 1960's, back when it was the privately-owned City Transit Company. 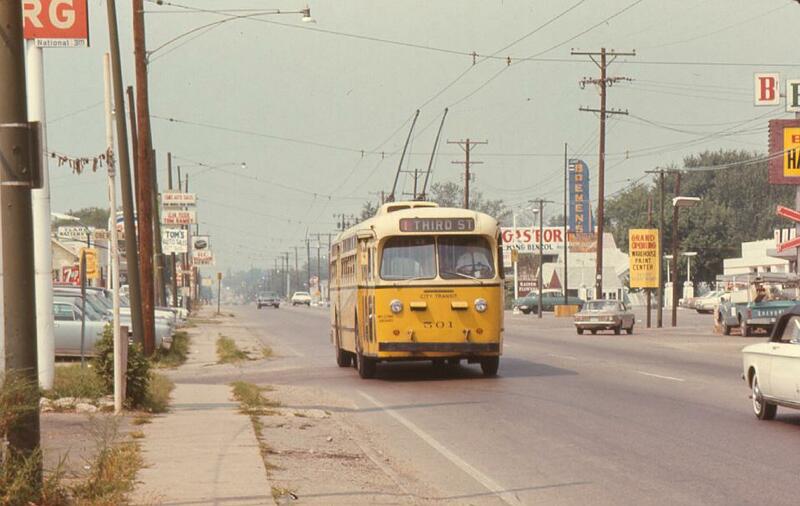 At the time, route 1, the Third Street line, was every five minutes on weekdays off-peak. Now it's every half hour. 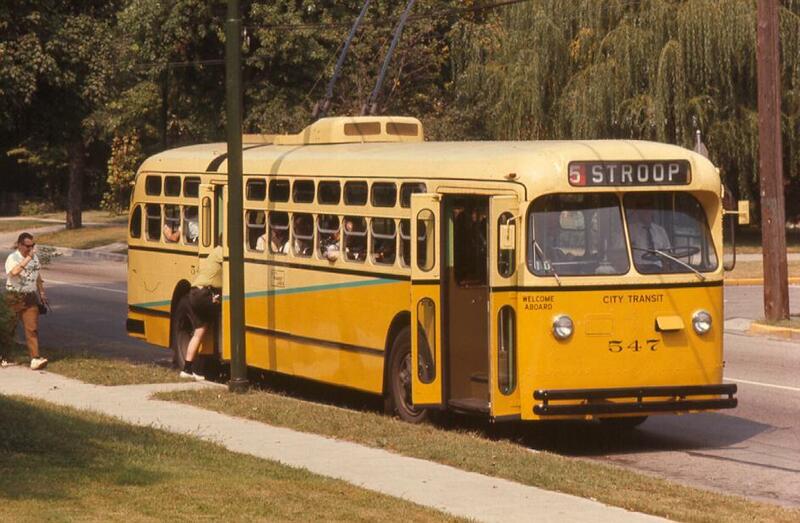 There were once 60 cities in North America with trolleybuses. Looks like we're headed for just four: Vancouver, San Francisco, Philadelphia and Boston. What a shame. This is what comes of all the disinformation about electric transportation coming out of groups like reason.org. mike, whats this about dayton etbs going in a year? anymore info? their etbs are only about 10-12 years old. I haven't seen anything published. 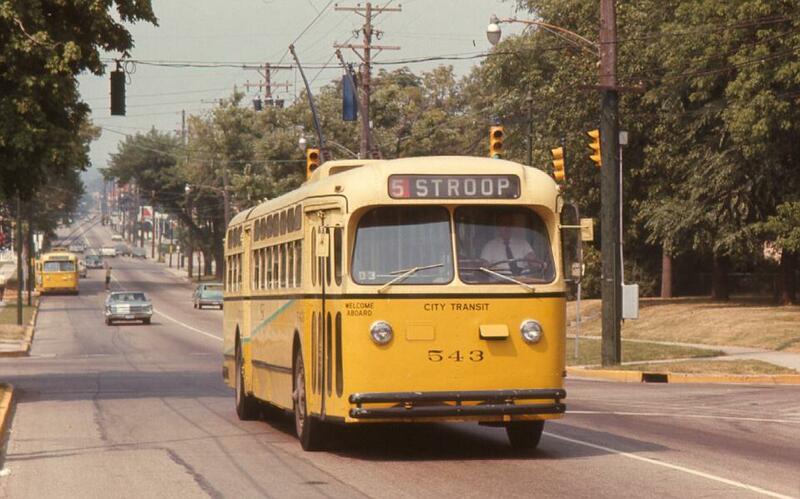 My friend from Pennsylvania based his conclusion on intuition: the depressed state of Dayton's post-industrial economy, the drastic cutbacks in scheduled service, the loss of several trolley bus lines since we were there in the 1960's and the fetish transit planners have for internal combustion. I will of course be overjoyed if this prediction turns out to be false. 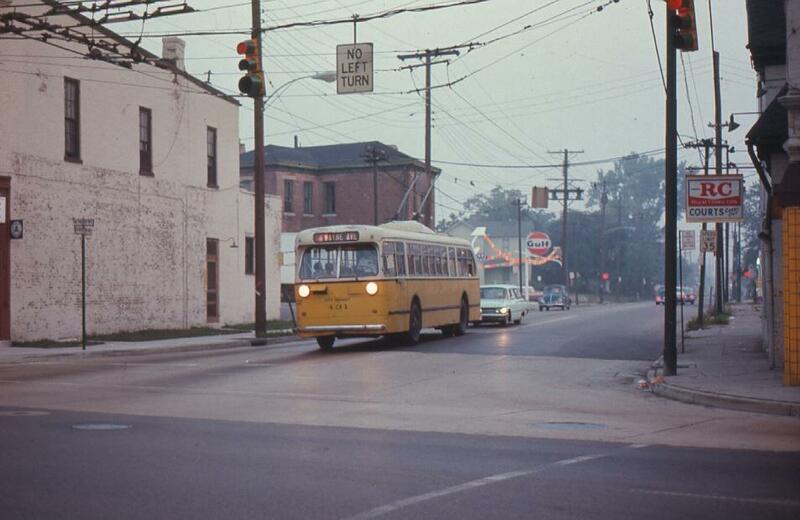 Here are some pictures I took on August 31, 1969. 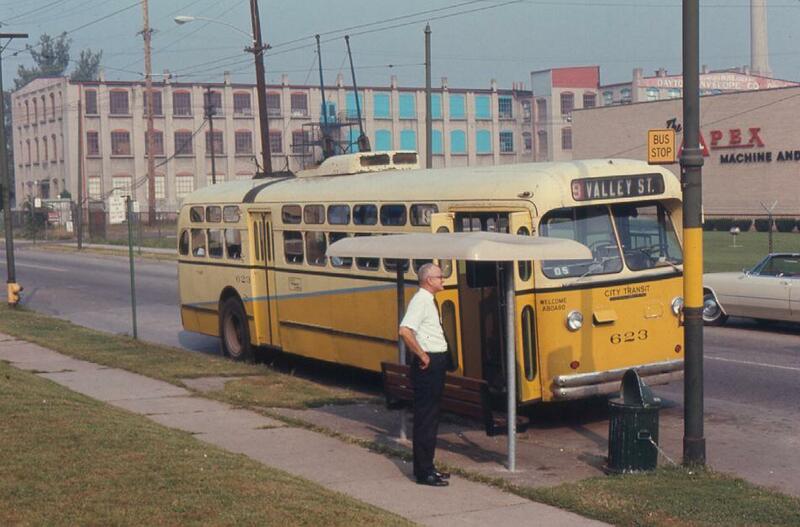 What a nice transit system this was compared to today. 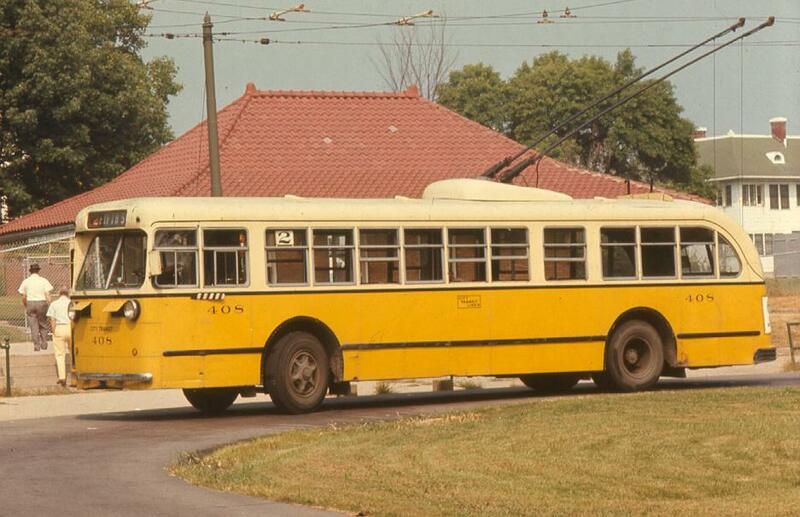 Pullman 427. Note the sixpack of 16oz Pepsis for 59¢. idem. This was our fantrip. 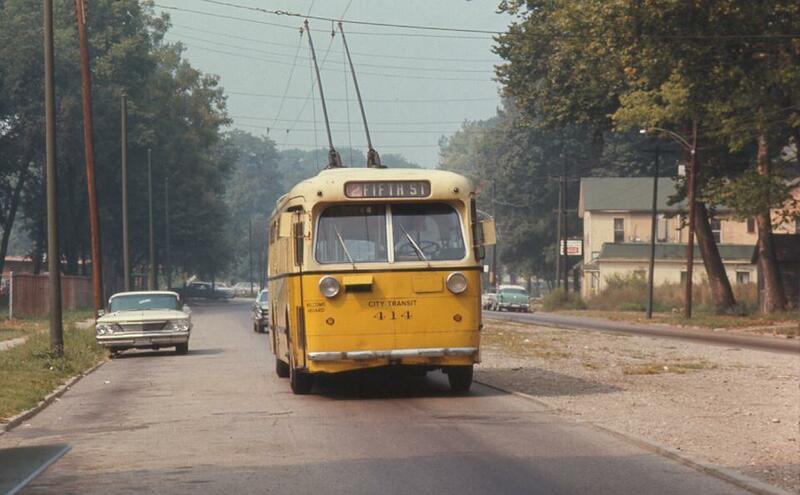 Pullman 414 om Fifth St. At the time, the former streetcar right-of-way on the boulevard was apparent. Marmon 547. This was the other ETB we chartered that day. Regular service Marmon. 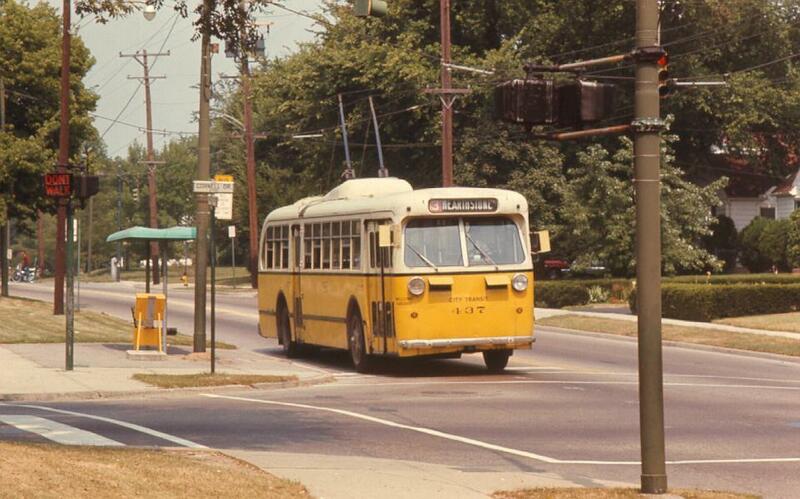 They had better service on this Sunday 40 years ago than they do today on a weekday. This is not a staged modern photo made to look authentic. Look at the parked cars. 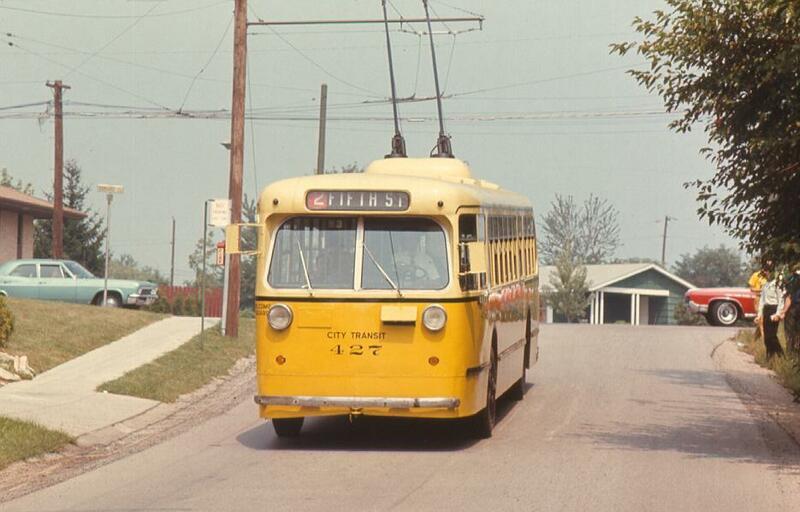 Regular service Marmon 543. 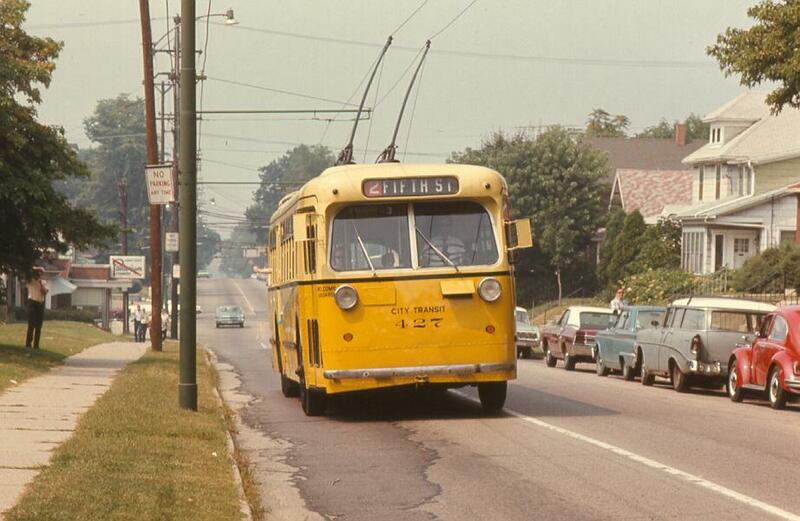 On of the fans pulled the polls on the chartered ETB to let the 543 pass. 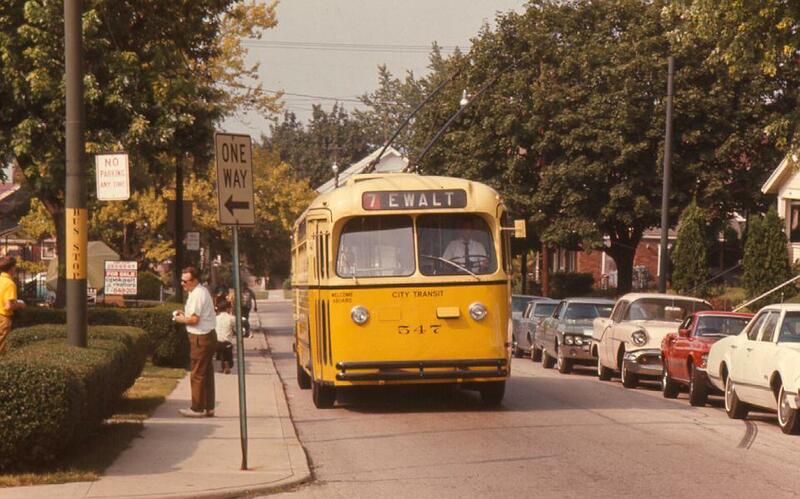 Less auto traffic in those days. Bollander Garage. The ETB's behind the fence were from Columbus. Pullman 437 in older paint scheme. Marmon 501. This line ran every twenty minutes on Sunday back then. 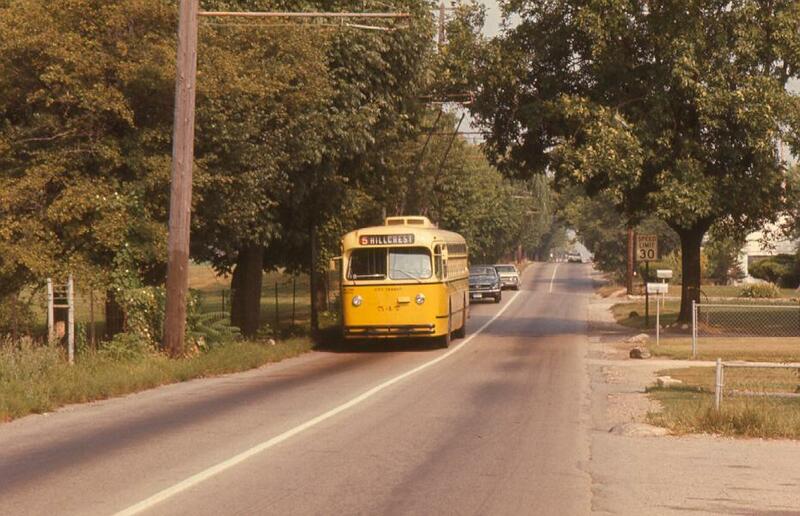 So often you notice in pictures taken at least 40 years ago how little motor vehicle traffic there was. We managed just fine without it. Another fan trip photo. Check out the pink 56 Pontiac. 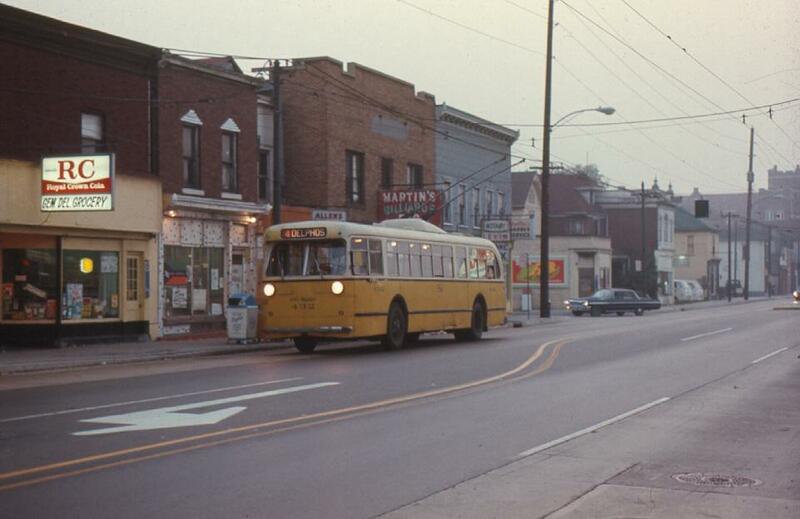 Pullman at dawn on Sunday, August 31, 1969. The asphalt in the center of the street covers the streetcar tracks still embedded in the pavement. Marmon 530. 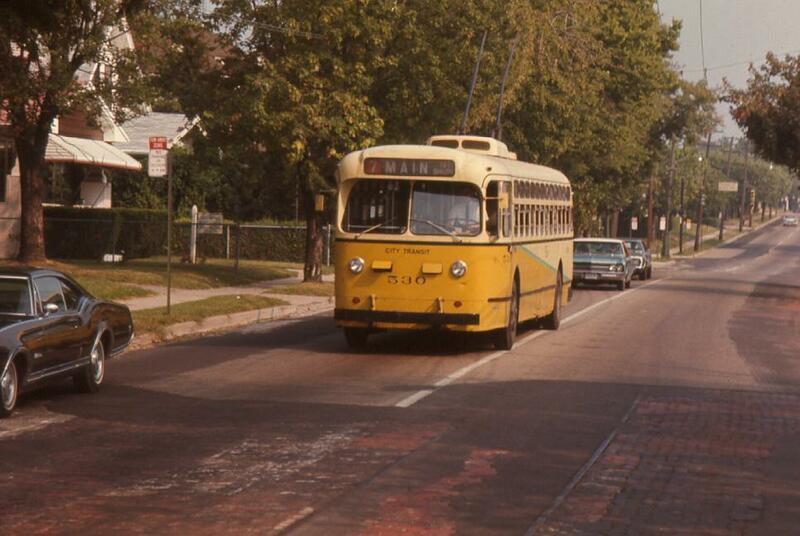 The streetcar tracks were from the Dayton & Xenia interurban. 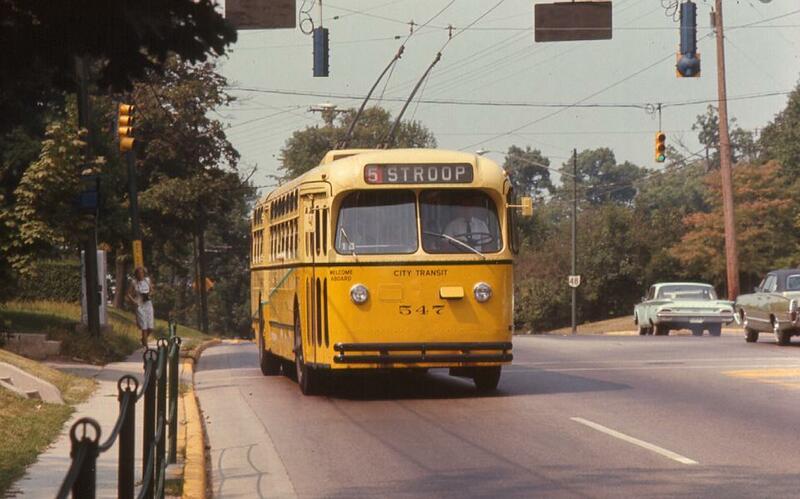 Why should they let the trolleybuses go in Dayton and Seattle, as much as they have in Edmonton recently and in Toronto and nearby Hamilton, ON in the 1990s? This isn't looking very good. Hamilton is, by the way, apparently looking at LRT currently. This would be good in the sense of a "rapid streetcar" for an area of half a million people, as with the nearby Waterloo Region, where LRT is in planning. Excellent photos. 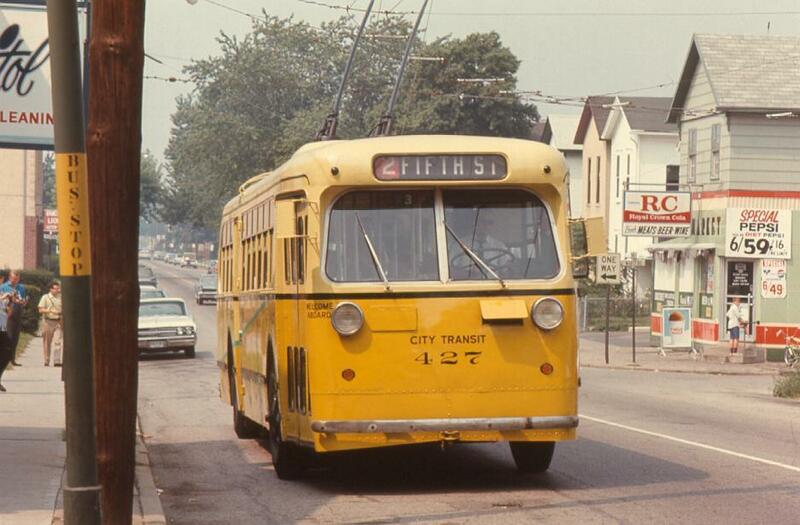 Even then, Halifax, Nova Scotia was still running trolleybuses until the end of the 1960s!! Here's an article I used to have on my website when I had one. It is from Hamilton resident Andy Hyslop Jr.